Namibia is suitable for a range of budgets. Enjoy an overland adventure, camping or staying in lodges/hotels. You can self-drive this dramatic landscape or fly the desert skies. First of all, the famous Etosha National Park is unique in Africa, known for the salt pan so large it can be seen from space. Also boasting an abundance of waterholes means wildlife congregates, giving you almost guaranteed game sightings. Look out for plains game, as well as the black rhino and cheetah. Damaraland is one of the most scenic areas in Namibia. This huge, untamed, ruggedly beautiful region offers plenty of adventure. See prehistoric water courses with open plains and grassland, massive granite koppies and deep gorges. Towards the west, the landscape dramatically changes with endless sandy wastes, that unbelievably, sustain small, but wide-ranging, populations of desert-adapted elephant, black rhino, giraffe, ostrich and springbok. The Caprivi is a 400-kilometre-long, narrow corridor of land in northeast Namibia. As the country’s wettest region, it sustains a wide variety of birds and animals. Here you can find the buffalo, elephant as well as the sable antelope and lion. The various reserves Bwabwata, Mudumu, Lizauli, and Mamili all protect the region’s wildlife. Located in Southern Namibia, Namib-Naukluft National Park is known for its’ huge orange sand dunes which are among the highest in the world; (many of them are above 200 metres) and for the pans of Sossuvlei and Dead Vlei. Covering almost 50,000km², it is one of the largest conservation areas in Africa and protecting one of the oldest deserts on earth. Sossusvlei is breathtaking with the 700 year old petrified camel thorn trees still standing amidst the vast white pan. 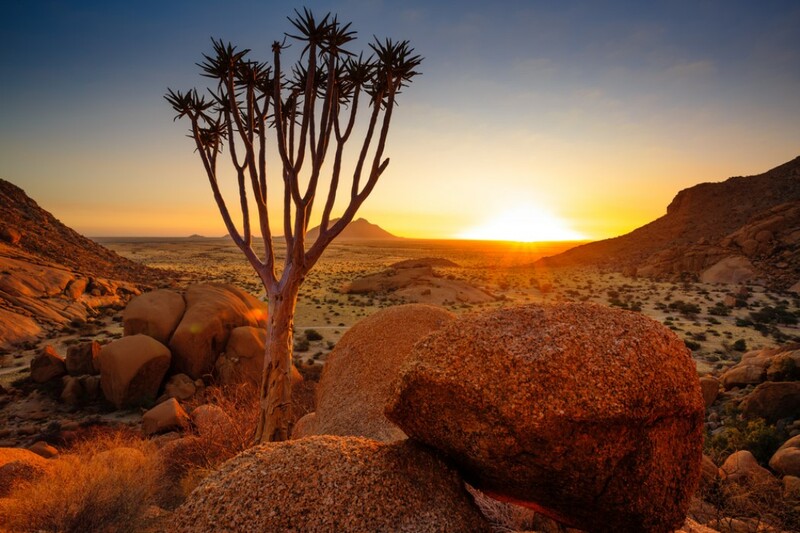 “The real highlight of this area is the spectacular scenery” says African Travel Specialist, Gemma. Experience the worlds highest sand dunes and the pans of Sossuvlei and Dead Vlei. “A “pinch me’ moment like no other” Gemma adds. Madagascar is the world’s fourth largest island. Located in the Indian Ocean just off the southeastern coast of Africa, Madagascar made its break from Africa around 165 million years ago and then from India nearly 100 million years later. Consequently, there is a unique flora and fauna range, with 90% of it’s wildlife found only in Madagascar. Almost all known species of lemur and half of the World’s chameleons call Madagascar home as does 350 species of butterfly as well as over 250 species of birds. Our African Travel Specialists team has seen a rise in demand for tailored travel experiences to this unique destination. From lemurs to colourful tribes, tropical beaches to bustling markets all set against a back drop of ever changing (and jaw-dropping) scenery. As a population, we just can’t get enough of Madagascar. It’s a city for walking where you will chance upon interesting places and dramatic views as you make your way across the hilly terrain. The Andasibe is another Madagascar “must”. This park is set amongst low forest covered hills, picturesquely dotted with lakes. The Ranomafana National Park is home to a tribal group, the Tanala. The Tanala have a reputation for the honey they produce as well as their unique farming methods. Offering a bustling market place, bargains galore, and an authentic and raw beauty unseen anywhere else in the world. Many Sakalava Tombs can be found secluded in the rocks across the 1,540 hectares of wildly eroded sandstone massif. Described as the greatest literary festival in the world. Every year, the Festival brings together the world’s greatest writers, thinkers, humanitarians, politicians, business leaders as well as sports people and entertainers. On the one stage this diverse mix of people express and engage in thoughtful debate and dialogue. A breath-taking display of kites taking to the sky all across the state. This bright and colouful celebration is unique to Rajasthan. While it is celebrated across the state of Rajasthan, the festivities peak in Jaipur. People flock from all over the country to be part of this spectacular festival. Udaipur World Music Festival is held every year during February. A festival of immense size and scale, it features diverse music from different continents and regions. Offering a stage to world-class musicians from around the world. 150 artists. 16 countries. One language – music. The Pushkar Camel Fair is one of India’s most highly-rated travel experiences. Each November during the Kartik Purnima full moon, you will see thousands of camels, horses and cattle. Over 400,000 people visit the area during a period of approximately fourteen days. Rajasthan has seen a recent surge in the number of boutique hotels. So, the area now offers a wide variety of accommodation options to suit every budget. In the already famous state, lesser-known districts like Pali are starting to hit the international visitor’s radar. Their central locations as well as proximity to improved airports are appealing. National parks and safari options are also now available in Pali. Boutique facilities such as Chandelao Garh and Deogarh have been responsible for making it easier for visitors to experience ‘off the beaten track’ in Rajasthan. Both represent authentic, intriguing, safe and relatively accessible offbeat destinations. So that concludes our specialists top 6 destination picks for 2018. Contact us today on 1300 761 980 and let us craft your perfect itinerary. We love what we do and we know you will too!